The Kansas City area benefits from its central U.S. location, robust telecommunications infrastructure and superior energy capabilities. Being centrally located provides a host of connectivity options and helps minimize overall latency to the East and West Coasts of the United States. Google selected the Kansas City area as the first site for its Gigabit Internet service known as Google Fiber. The service provides area businesses, schools, and homes with connection speeds 100 times faster than today’s average Internet. The announcement is expected to expand an already large online services market. Kansas City is consistently ranked among the best for reliable power service. Kansas City also offers one of the lowest utility costs in the country and has been ranked #2 in the United States for enterprise data center operating affordability. The Midwest location also reduces the likelihood that KC-based operations will become a target for disruption. The US Geological Survey map shows the Kansas City area to be in relatively little threat of significant activity for earthquakes. The National Severe Storm Lab map illustrates the total annual threat of tornadoes in the US. 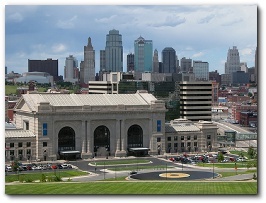 The mean number of days with one or more events within 25 miles of KC is 1.0 days per year. Being located underground further mitigates the risk of natural disasters. All of these factors help make this an ideal location for hosting mission critical data.